4. Department of Nephrology, University Hospital, Cracow, Poland. Background: Proton pump inhibitor (PPI) use was reportedly associated with an excess of adverse cardiovascular (CV) events, thus making their systemic effects relevant to public health. PPIs reduce gastric acid secretion, causing increased gastrin release. Gastrin stimulates β-cell neogenesis and enhances insulin release, exerting an incretin-like effect. Our aim was to assess, if PPI usage is associated with altered glycaemia in patients with CV disease. Methods: We retrospectively analyzed medical records of 102 subjects (80 with ischemic heart disease) who underwent a routine oral glucose tolerance test while hospitalized in a cardiology department. Fasting and 2-h postload glucose levels were compared according to PPI use for ≥1 month prior to admission. Results: Compared to 51 subjects without PPIs, those on a PPI were older, more frequently male, had a lower body-mass index and a tendency to a worse renal function. PPI users and non-users exhibited similar glucose levels at baseline (5.6 ± 0.9 vs. 5.5 ± 1.1 mmol/l, P = 0.5) and 2-hrs post glucose intake (9.8 ± 3.0 vs. 9.9 ± 3.4 mmol/l, P = 0.9). This was consistent across subgroups stratified by gender or diabetes status. The results were substantially unchanged after adjustment for different characteristics of subjects with and without PPIs. Conclusions: PPI use does not appear associated with altered glycaemia in subjects with CV disease. Unchanged glucose tolerance despite PPI usage may result from simultaneous activation of pathways that counteract the putative PPI-induced incretin-like effect. Keywords: cardiovascular disease, glucose tolerance, proton pump inhibitors. Proton pump inhibitors (PPIs) are among the most prescribed drugs worldwide. PPIs use was reportedly associated with an excess of adverse cardiovascular (CV) events, thus making their systemic effects relevant to public health. This association was described in various study groups, including post-myocardial infarction patients on clopidogrel in addition to aspirin  or regardless of clopidogrel use , and even in general population subjects largely free of any antiplatelet drugs . Therefore, it can be hypothesized that an elevated risk of myocardial infarction in patients taking PPIs might - at least in part - result from yet unknown mechanisms not directly involving platelet aggregation, and unrelated to putatively abnormal absorption of antiplatelet drugs. Thus, of clinical relevance is the investigation of potential novel pathways which may contribute to systemic PPIs effects. Gastrin is released from antro-duodenal G cells in response to a meal and stimulates gastric acid secretion by the parietal cells of the stomach. Gastrin release is inhibited by a low pH via negative feedback, so gastrin release is increased in PPI users. Gastrin also acts on pancreatic β-cells: stimulates β-cell growth and neogenesis  and enhances glucose-stimulated insulin release, i.e. exerts an incretin-like effect . The incretin effect, ascribed mainly to glucagon-like peptide 1 (GLP-1) and glucose-dependent insulinotropic polypeptide (GIP), has re-gained attention in recent years, which was associated with the introduction of incretin hormones-based therapies in diabetes . Of note, over 40 years ago it was demonstrated that gastrin was able to produce an incretin-like effect at physiological levels  that are similar to the degree of chronic hypergastrinemia reported in PPI users . A novel GLP-1-gastrin dual agonist improved glucose homeostasis in experimental models of obesity and diabetes with the reference to a GLP-1 receptor agonist alone [8-10]. However, clinical studies on the hypothetical ability of PPI to improve glucose tolerance brought inconsistent results . Moreover, these investigations were largely focused on glycemic control in subjects with type 2 diabetes. Of note, subjects with elevated glucose levels below the diabetic threshold also exhibit a higher risk of CV mortality  and predisposing abnormalities . Thus, our aim was to estimate, if PPI use is associated with lower fasting or postload glycaemia in patients with cardiovascular disease. We retrospectively analyzed medical records of 102 patients (62 men and 40 women; mean age, 66 ± 10 years) without a previous history of established diabetes hospitalized in a cardiology department who underwent a 75-g oral glucose tolerance test (OGTT) as a routine diagnostic test prior to discharge. Exclusion criteria included severe renal insufficiency (estimated glomerular filtration rate [GFR] below 30 ml/min per 1.73 m2 by the Modification of Diet in Renal Disease [MDRD] study equation), hemodynamic instability, severe respiratory insufficiency, anemia and other significant coexistent diseases or relevant abnormalities in routine laboratory analyses. All patients were receiving a standard medication in accordance with current practice guidelines. Fasting and 2-h postload glucose levels were compared according to PPI use for ≥1 month before admission. Additionally, the analysis was repeated for the study patients stratified by gender and diabetes status. Diabetes and other glucose tolerance categories were defined in agreement with the 2003 recommendations of the American Diabetes Association  on the basis of the results of the OGTT performed during the index hospitalization. The ethics committee of our university approved the study protocol and the fact that informed consent was not sought owing to a retrospective study design (Approval number: 122.6120.228.2016). Data are shown as mean and standard deviation (SD) or numbers (n) and percentages. Clinical characteristics of the study subjects were compared between PPI users and non-users by means of a 2-tailed Student's t-test for continuous variables and Fisher's exact test for categorical data. The study design allowed to detect a difference in glycaemia between PPI users and non-users of about 0.55 SD - i.e. 0.5 mmol/l for fasting glycaemia and 1.7 mmol/l for 2-h postload glucose - with a power of 80% at a type I error rate of 0.05. In order to adjust for different characteristics of patients with and without PPI, analysis of covariance (ANCOVA) was done with glycaemia as a dependent variable and characteristics for which the intergroup P value was <0.15 as covariates. A P value below 0.05 was considered significant. The analyses were performed using STATISTICA (data analysis software system), version 12 (StatSoft, Inc., Tulsa, OK, USA). Our study group consisted of 102 subjects, with a discharge diagnosis of ischemic heart disease in 80 patients (78%) and heart failure in 26 patients (25%). By means of an OGTT performed during the index hospitalization, normal glucose tolerance was confirmed in 25 patients (24%), whereas impaired fasting glucose (IFG) or impaired glucose tolerance (IGT) were detected in 42 subjects (41%). In addition, in 35 subjects (34%) type 2 diabetes was diagnosed on the basis of the OGTT. Compared to 51 subjects without PPIs, those on a PPI (mostly omeprazole 20 mg o.i.d. or pantoprazole 20 mg o.i.d.) were older (69 ± 9 vs. 64 ± 10 years, P = 0.004), more frequently male (71 vs. 51%, P = 0.07), had a lower body-mass index (BMI) (26.9 ± 3.4 vs. 29.3 ± 4.9 kg/m2, P = 0.006) and a tendency to worse renal function (GFR: 71 ± 19 vs. 76 ± 17 ml/min per 1.73 m2, P = 0.13) (Table 1). Selected clinical characteristics of the study subjects according to PPI use prior to admission. aBy 2-tailed Student's t-test or Fisher's exact test for continuous and categorical data, respectively. Abbreviations: GFR: estimated glomerular filtration rate; IFG: impaired fasting glucose; IGT: impaired glucose tolerance; PPI: proton pump inhibitor; SD: standard deviation. PPI users and non-users exhibited similar glucose levels at baseline (5.6 ± 0.9 vs. 5.5±1.1 mmol/l, P = 0.5) and 2-hrs post glucose intake (9.8 ± 3.0 vs. 9.9 ± 3.4 mmol/l, P = 0.9) (Table 2, Figure 1). This was consistent across subgroups categorized by gender and diabetes status (Table 2, Figure 2 A-B). The adjustment for age, BMI and GFR by ANCOVA did not substantially change the results. 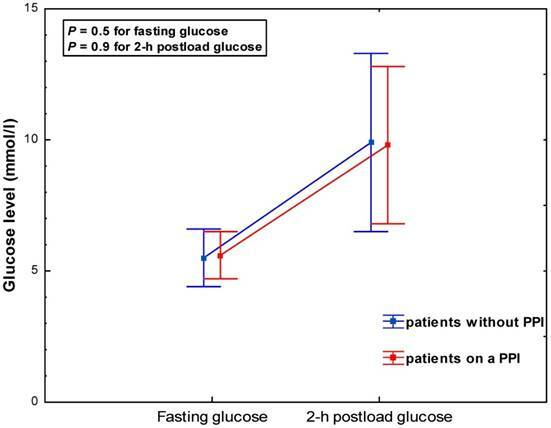 Fasting and 2-h postload glucose according to PPI use prior to admission. Data are shown as mean ± SD; P values by 2-tailed Student's t-test. Our study showed no association between PPI use and fasting or postload glycaemia in patients with CV disease irrespective of diabetes status. Glycaemia during a 75-g oral glucose tolerance test according to PPI use - all study subjects. Glycaemia during a 75-g oral glucose tolerance test (OGTT) according to PPI use - patients stratified by diabetes status: (A) subjects without diabetes; (B) subjects with newly-diagnosed type 2 diabetes detected on the basis of the OGTT. To the best of our knowledge, the effect of PPI on glucose levels in non-diabetic subjects was previously assessed in only one study  that reported lower fasting glycaemia and higher concentrations of insulin after 12 weeks of pantoprazole administration in 38 healthy volunteers. 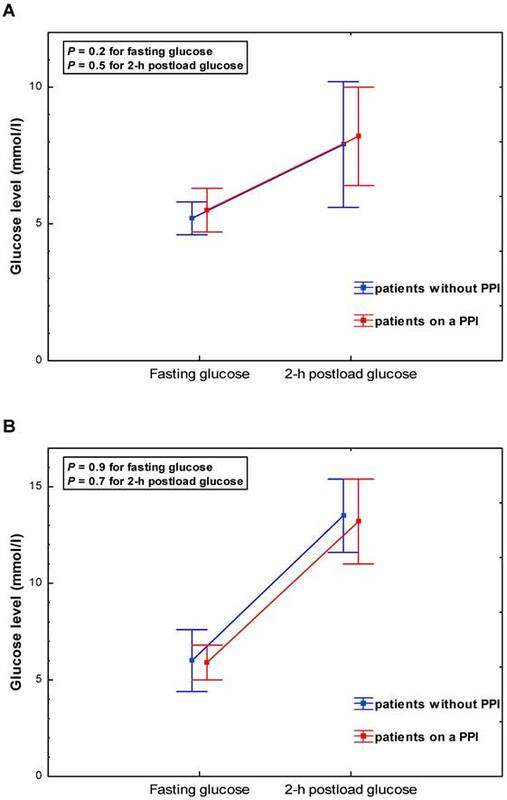 In our hands, chronic PPI use was unrelated to glucose levels - either fasting or 2-h postload. Thus, our negative result adds to a controversy about the effect of chronic PPI use on glucose tolerance. Both positive and negative results were published with regard to the ability of PPI usage to affect glycemic control in patients with type 2 diabetes. This was found for cross-sectional retrospective studies [16-20] and randomized, double-blind, placebo-controlled studies [21-23]. The rationale for the previous studies [15-23] and our retrospective analysis was the previously demonstrated incretin-like effect of gastrin , which was shown at circulating gastrin concentrations that were comparable to those reported in long-term PPI users . Admittedly, gastrin is without effect on basal insulin secretion and small rises in gastrinemia on oral glucose challenge are unlikely to affect the non-glycemic insulin release under these conditions [5, 24]. However, peptides and amino acids are a much more potent stimulus for gastrin release. It is noteworthy that the incretin-like effect of gastrin (reflected by an almost 2-fold higher integrated insulin response) was demonstrated upon synthetic human gastrin-17 infusion at the lowest dose which increased circulating gastrin by the same order of magnitude as those observed for maximal concentrations of endogenous gastrin (about 3-fold) after a protein-rich meal . In addition, interactions with other hormones may contribute to effects of gastrin on glucose metabolism. Gastrin stimulates GLP-1 secretion by intestinal L cells  and down-regulates the release of ghrelin , the “hunger hormone” that also inhibits insulin secretion in the islets . Moreover, joint GLP-1 and gastrin receptor coactivation ameliorated glucose homeostasis and induced a more profound increase in insulin response and β-cell mass compared to GLP-1 agonism alone in animal models of diabetes [8-10, 28]. Finally, in diabetic mice these metabolic effects were mimicked by combination therapy with a GLP-1 receptor agonist and a PPI, which was associated with an over 2-fold increase in endogenous gastrin levels . Unchanged glucose tolerance despite PPI usage may result from simultaneous activation of pathways that counteract the PPI-induced incretin-like effect of gastrin. First, because gastrin stimulated both insulin and glucagon secretion in anesthetized dogs  and in isolated, perfused canine pancreas , higher levels of gastrin on chronic PPI therapy may enhance not only insulin but also glucagon release that could oppose the glucose-decreasing effect of insulin. Second, PPIs lowered the formation of nitric oxide (NO), an endogenous ubiquitous mediator, via potentiated accumulation of the endogenous NO synthesis inhibitor asymmetric dimethylarginine (ADMA) in human cultured microvascular endothelial cells, blunted endothelium-dependent relaxation in murine aortic rings ex vivo, and increased circulating ADMA in mice . Since a report based on OGTT and hyperglycemic clamps in healthy subjects administered L-NG-nitroarginine methyl ester, an inhibitor of NO synthesis, suggested that endogenous NO might enhance the glucose-dependent insulin release and reduce insulin clearance , the PPI-induced NO deficiency - if clinically confirmed - could hypothetically attenuate the incretin-like effect of hypergastrinemia associated with PPI use. On the other hand, the notion of endogenous NO as a modulator of glucose homeostasis  comes from experimental studies whose results cannot be simply extrapolated into clinical conditions [33, 35]. In particular, L-NG-nitroarginine methyl ester may affect glycaemia also via adrenal epinephrine release , and the inhibition of the insulin-degrading enzyme through S-nitrosylation was demonstrated only in vitro at high concentrations of artificial putative NO donors and consequent exposure to supraphysiological levels of NO liberated from these compounds . Moreover, in a recent clinical observational study , we did not confirm the PPI-ADMA interaction. The incretin effect is defined as insulin-releasing activity of gut hormones, which explains a higher insulin response to oral than intravenous glucose at an equivalent level of glycaemia [38-40]. This term was launched in 1929 to explain the ability of upper gut extracts to lower glycaemia, presumably via a higher insulin secretion (INtestine seCRETtion INsulin) . According to current views, the incretin effect is linked predominantly to GLP-1 and GIP [6, 42, 43], both of which are degraded by the widely expressed dipeptidyl peptidase IV (DPP-4). GLP-1 stimulates the glucose-induced insulin secretion, inhibits glucagon release and delays gastric emptying, all of which contribute to glucose lowering . The translation of the knowledge of incretin biology has led to the development of GLP-1 receptor agonists and DPP-4 inhibitors as hypoglycemic agents. Recently, extraglycemic effects of the classical incretin GLP-1 were reported, including vasodilation and prevention of post-ischemic myocardial dysfunction and injury [44, 45]. Of note, cardioprotection was also induced by a metabolically inactive product of GLP-1 breakdown . Whether chronic elevations of circulating gastrin in patients taking a PPI may also exert an influence on the heart and vasculature is unknown. First, we performed a cross-sectional retrospective study in a relatively low number of subjects, while a longitudinal placebo-controlled cross-over design would be much better to verify our working hypothesis. Nevertheless, we have limited our retrospective analysis to those without relevant coexistent diseases and receiving a standard guidelines-based medication in order to decrease subjects' heterogeneity. Second, neither fasting nor postload insulin levels were measured and we were not able to calculate any indices of insulin resistance or β-cell responsiveness, which constrains mechanistic interpretation of the results. On the other hand, the magnitude of glycaemia is also of clinical importance in terms of prognostic predictive ability with regard to CV outcome. Finally, the information on PPI use prior to admission was self-reported, which could also pose a bias. PPI use does not appear to be associated with altered glycaemia in subjects with CV disease. Unchanged glucose tolerance despite PPI usage may result from simultaneous activation of pathways that counteract the PPI-induced incretin-like effect. Further studies are warranted to explore putative novel pathways contributing to the net impact of PPIs on CV outcome. ADMA: asymmetric dimethylarginine; ANCOVA: analysis of covariance; BMI: body-mass index; CV: cardiovascular; DPP-4: dipeptidyl peptidase IV; GFR: estimated glomerular filtration rate; GIP: glucose-dependent insulinotropic polypeptide; GLP-1: glucagon-like peptide 1; IFG: impaired fasting glucose; IGT: impaired glucose tolerance; NO: nitric oxide; OGTT: oral glucose tolerance test; PPI: proton pump inhibitor; SD: standard deviation. Results of the study were presented as an oral communication at the 24th International Medical Students' Conference (Cracow, Poland) on April 15th, 2016. This work was supported in part by a research grant (No. K/ZDS/006105) from the Faculty of Medicine, Jagiellonian University Medical College, Cracow, Poland. The publication of this paper was supported by the Faculty of Medicine, Jagiellonian University Medical College, Leading National Research Center (KNOW) 2012-2017.